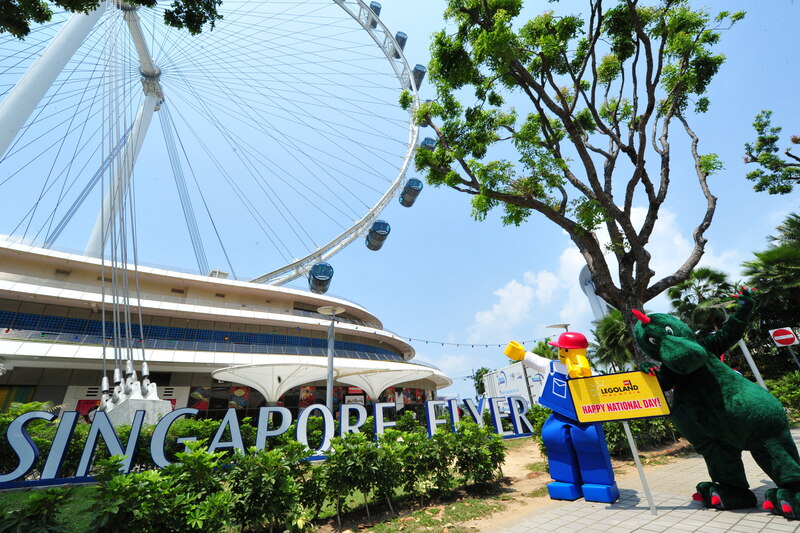 LEGOLAND® MASCOTS JOIN NATIONAL DAY CELEBRATIONS WITH SPECIAL APPEARANCE AT SINGAPORE FLYER. – Singapore Flyer, the world’s largest Giant Observation Wheel hosts Ollie and Buddy, LEGOLAND® mascots as they participate in activities for the iconic celebration. – Spot-your-picture and win surprise giveaways in conjunction with National Day celebration. – Park gears for opening on 15th September 2012 and will be fully operational as per earlier announcement. SINGAPORE, 9th August 2012 – A huge crowd turnout was seen as the two mascots from LEGOLAND® made a special appearance at the Singapore Flyer and joined the nation’s 47th National Day celebrations. Bearing a huge sign reading, “Happy National Day” the two mascots mingled with the crowd and gave away some goodies during the festivity. Spotted at three major locations around the Singapore Flyer, Ollie and Buddy, as they are famously known, participated in the celebration to promote the upcoming Theme Park. Once open on 15th September 2012, the Park will be the first LEGOLAND in Asia. Work is on schedule and the Park will be fully operational when the gates open in just over a month. Over the next few weeks, the 76-acres site will be landscaped and rides are already being tested and handed over progressively to the operations team. Frontline employees have also started training. Currently, the Park has hired more than 560 staff and the team is expected to reach its target of 1,000 people by the opening of the Water Park in 2013. The proximity of LEGOLAND® in Nusajaya, Johor is approximately 15 minutes from the Tuas 2nd Link. This makes Singapore an ideal resident market for the international brand. LEGOLAND® has also been actively promoting itself around the region including Indonesia, Thailand, China and India. “We have a beautiful display of Singapore in our Miniland cluster and within this, the Flyer is a key attraction,” he added. Miniland, is known as the heart of all LEGOLAND® worldwide. There are five LEGOLAND Parks in the world with locations in the United Kingdom, United States, Denmark and Germany. In this particular area of the Park, clusters are recreated using thousands of LEGO® bricks. The newest LEGOLAND Miniland pays special tribute to Asia. There are 17 areas including one dedicated to Singapore. Singapore Flyer in a statement said, it was honoured to be the first venue in Singapore to host the mascots and be featured in Miniland. The replica has been created to detail in a scale of 1:20 and even moves like the real thing. “We are delighted to have welcomed our special friends from LEGOLAND® to join in our National Day celebrations, together with other activities such as dance performances and Tug-of-War clinic. 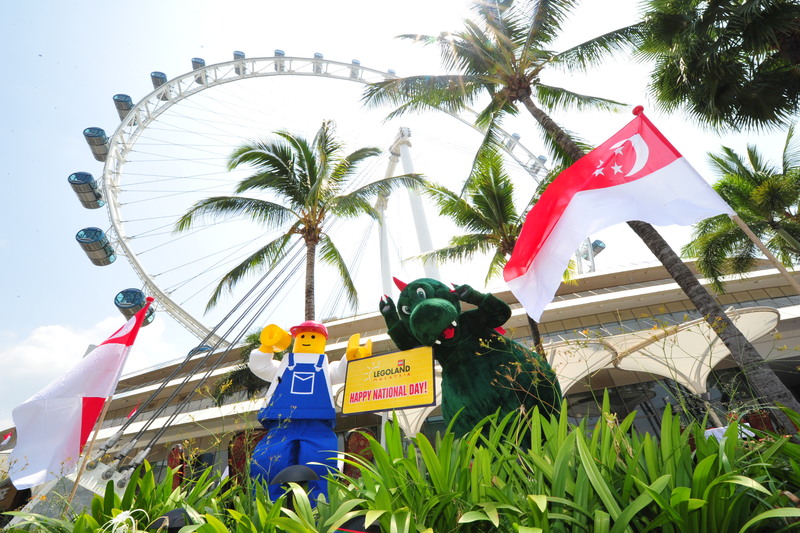 With both the Flyer and LEGOLAND as world-class attractions, the mascots’ appearance was our way of showing our support and that we are excited about the Park opening soon,” said Jeff Tan, Senior Sales & Marketing Director, Singapore Flyer. Apart from Miniland, the Park has created seven themed concept areas and visitors can expect to be occupied around the clock. Every area is unique and the Park has more than 40 rides, shows and attractions. There are also three restaurants with seating capacity of up to 500 people. There are also more than 10 food carts and a variety of snack stations dotting the Park. To date up to 50,000 Annual Passes has been pre-sold and the early figures are encouraging. “People in Singapore, Malaysia and around the region have shown good support to us and we cannot wait to showcase our Park to them soon,” added Mr. Boerst. 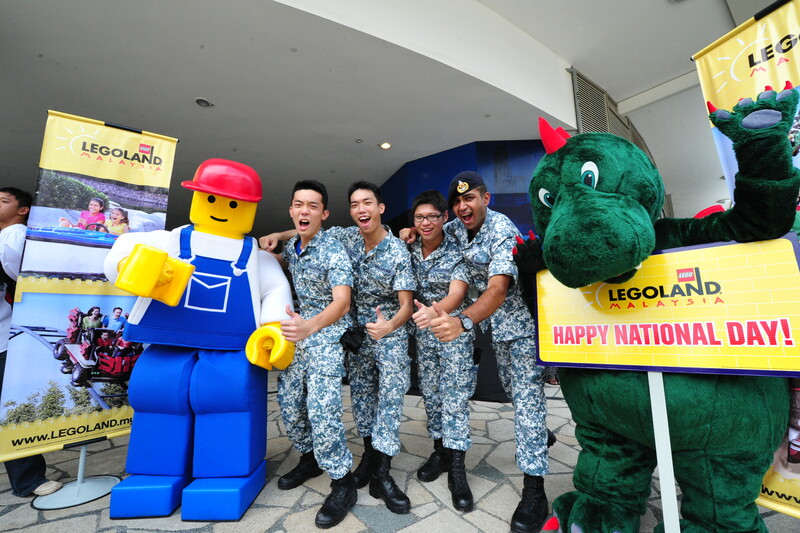 As appreciation and in conjunction with the National Day, LEGOLAND® is also giving away a nice surprise to Singaporeans. 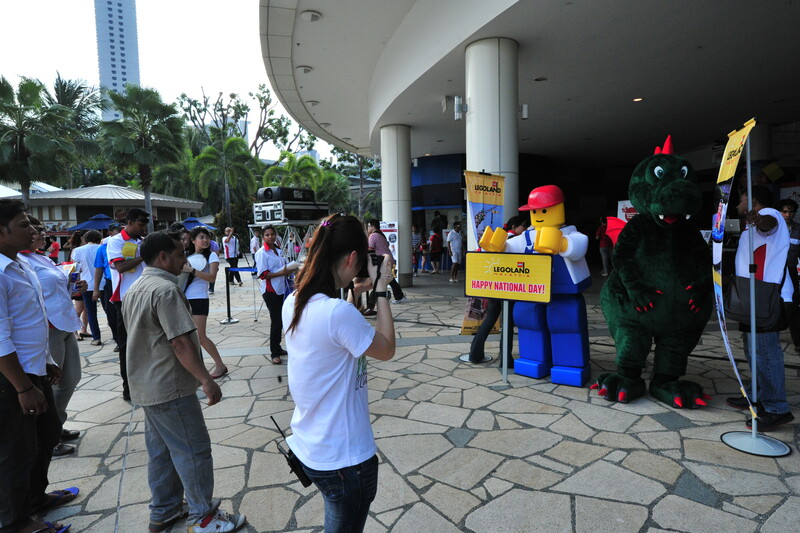 For the giveaway, visitors at the Flyer were asked to spot the mascots and have their picture taken by the LEGOLAND official photographer. Beginning 10th August, these pictures will be posted on the Official LEGOLAND Malaysia Facebook page and if your picture appears on the page get in touch with LEGOLAND at: info@LEGOLAND.my and you might just receive a surprise gift. As the number of giveaways is limited, it will be on a first-come, first-served basis. Terms and conditions apply. The family focused theme Park is also still selling its Annual Passes online (www.LEGOLAND.my) and soon the 1-Day tickets are expected to go online as well. For those that have purchased their Annual Pass prior, an early bird redemption offer is also being planned to avoid long crowds and wait lines during opening. An announcement will be made soon with the dates. I have just discovered your blog! ^^Amazing pictures! I will see it again for sure! Hi bearyourfashion, thanks for dropping by! Yes, please drop by again anytime! Its really nice to hear such positive comments from fellow bloggers. Will be exploring your site too! =] stay in touch. Excellent! Legoland Windsor (UK’s Legoland) is just around the corner from me. I used to love going there. Nice!!! I cant wait to head to my 1st lego theme park! Im very very excited Megan!